The patio is an outdoor living space. Over the years, it has become more than just a bench and table space. Nowadays, it has become more comfortable and an outdoor version of an indoor living room. It provides a lavish space for enjoying the outdoors, the breeze, and the sun. It is a place for relaxation, a place to hang out with friends, or have barbecue Sundays with family. It has become such an essential area in any home that every homeowner is making an effort to have one and maintain one. However, if the concrete patio is ugly, damaged, or boring, the maximum effect won’t truly be experienced. The patio would be a disappointing space and an eyesore. 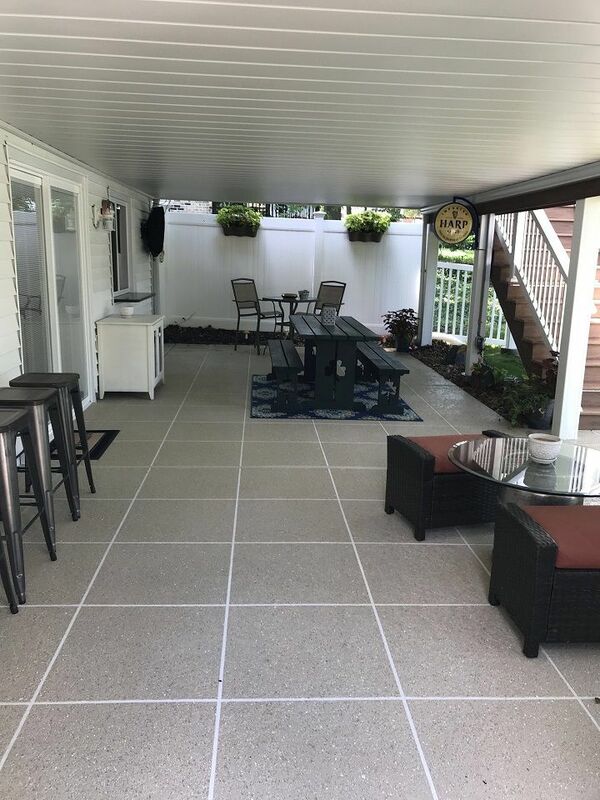 Homeowners would be glad to know that there are overlays and coatings available to improve the look and function of the patio without breaking the bank. 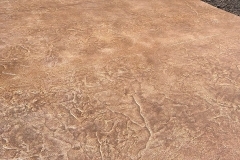 Why Choose a Decorative Concrete Patio? These overlays and coatings are not called decorative for nothing. They look great and are highly customizable. It is durable and long-lasting. Although only a thin layer of material is used, resurfaced patios stay strong and damage-free for several years as long as it is properly installed. It does not require tedious cleaning and maintenance. A simple sweeping and an occasional mopping will do wonders to its appearance and lifespan. It is an economical solution to an otherwise expensive slab removal and replacement. It provides several benefits without robbing you of your hard-earned money. 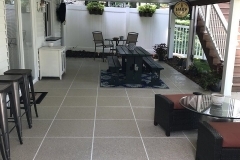 Stamped Concrete Overlay – If you are a big fan of brick, stone, or tile surfaces but can’t afford to invest in one, then a stamped concrete patio overlay is a must-have. The overlay can be stamped with patterns that mimic high-end materials. It can be stamped with cool patterns and slip-resistant textures, too. 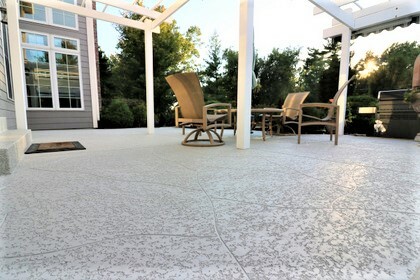 Spray Knockdown Finish – This spray down concrete system uses an acrylic concrete coating that is sprayed and troweled down, creating a texture that is stunning and slip-resistant. It also stays cool to the touch, great for hot and humid days. Enjoy the outdoors with style. 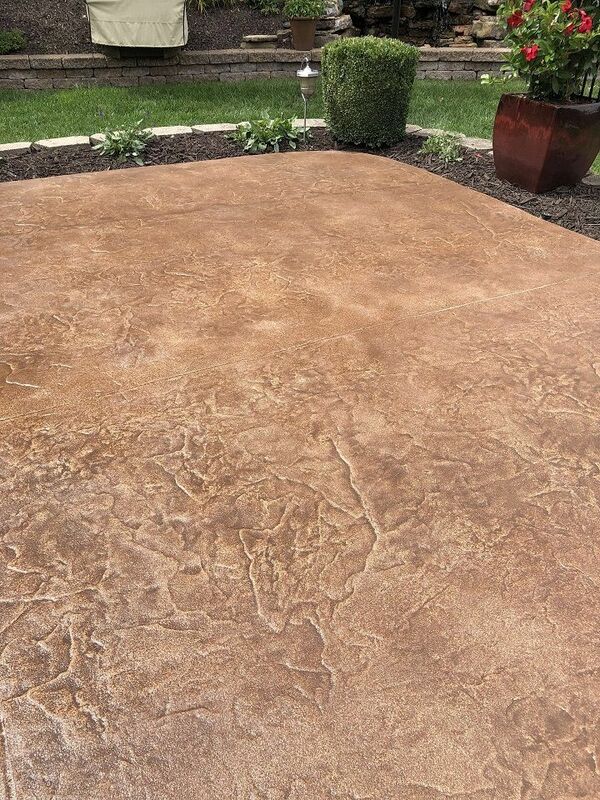 Call (816) 307-0325 for more concrete patio options! The patio is an important area in any residential home. It allows you to enjoy the outdoors while enjoying the comforts of the indoors at the same time. Kansas City Concrete Artisans does more than improve your concrete patios. We want nothing more than to improve the quality of your life and enhance every your every experience on the patio, whether in solitary or with family and friends. Have great ideas that you want to discuss? We’d love to hear about it. Call or email us for a free visit and consultation.